"We serve all military aligned students and their dependents to transition into the academic environment by supporting their needs from pre-admission enrollment to post graduation employment." Welcome to all Armed Service Members, Veterans, Spouses and your Dependents. 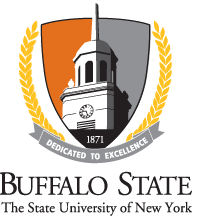 Buffalo State is honored to help support and guide you on your higher education experience. At Buffalo State, your core values, experiences, and service are not overlooked. We are committed to the intellectual, personal, and professional growth of all our students. The goal of the college is to inspire a lifelong passion for learning, and to empower a diverse population of students to succeed as citizens of a challenging world. Wide Range of support/referral resources "One Stop Resource Center"
Ranked #2 (public college) Military Friendly School for 2018 by Victory Media Inc.